You don't see so many of them these days, but in 1989, cover versions were still fairly common on the ARIA top 50 singles chart. In fact, a quick count reveals seven of the top 50 were remakes (while a handful more featured samples of previous hits). At number 1 this week in 1989, Roxette had seemingly settled in permanently with "The Look" spending a fourth week on top - and once again keeping Kate Ceberano's "Bedroom Eyes" stuck at number 2. 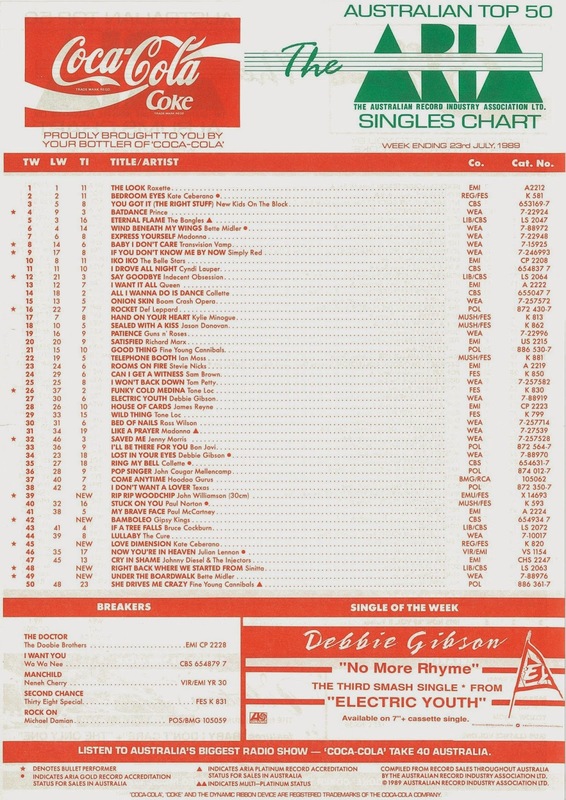 Just when it looked like Debbie Gibson was gaining some traction in Australia, she was back where she started with this third single from Electric Youth - and that was placing singles just outside the top 50. "No More Rhyme" was another self-penned ballad from the American teen star but it didn't connect in the way "Lost In Your Eyes" had. And it wasn't just in Australia - in the States, "No More Rhyme" became her second singe in a row to miss the top 10, landing at number 17. Watch out for The Wonder Years star Danica McKellar in the clip - she's the one "playing" the cello. 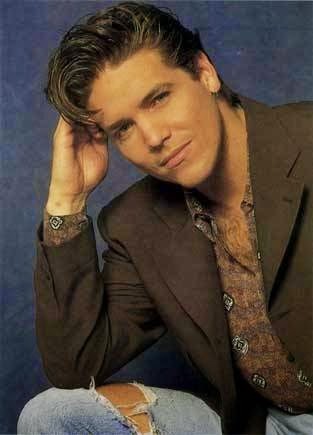 He'd played singer Danny Romalotti on The Young And The Restless since the start of the decade and finally Michael Damian's real-life career began to resemble that of his successful daytime soap character when this remake of the David Essex track (which appeared in the film Dream A Little Dream) shot to number 1 in the US. Despite the show being quite popular with stay-at-home mums and uni students locally, Australia was not as impressed by this rendition of the 1973 Australian number 8 hit. Michael shouldn't have been discouraged, though, since his wasn't the only version of "Rock On" to fall short - as we saw in November 1987, a cover by John Justin also scraped the lower reaches of the chart. It was back-to-back cover versions for Bette Midler with this second single from the Beaches soundtrack to hit the ARIA top 50. Of course, as mentioned in April, "Under The Boardwalk" had actually been the lead single from the film in the US, but a big weepy film deserved a big weepy hit single and "Under The Boardwalk" would end up overshadowed by number 1 hit "Wind Beneath My Wings". Originally recorded by The Drifters in 1964 (and only reaching number 62 locally, but number 4 in the US), "Under The Boardwalk" had also been released as a single two years earlier by Bruce Willis. Yep, the Die Hard actor included the song on his debut album, The Return Of Bruno, in 1987 and remarkably got to number 2 in the UK with his take on the soul classic. Our third remake comes from a British singer whose previous biggest hit was the camp classic "So Macho" in 1986. Incidentally, in 2014, Sinitta covered another gay anthem, "So Many Men, So Little Time" - a song first released by her own mother, Miquel Brown in 1983. Anyway, getting back to, er, where we started from... "Right Back Where We Started From" was made famous by Maxine Nightingale in 1975 and became a number 4 hit in Australia early the following year. Sinitta's PWL-produced update was a fairly faithful rendition, which not only gave her the biggest single of her career in Australia but returned her to the UK top 10 for a fourth and final time. With "Bedroom Eyes" getting no closer to hitting the number 1 spot, Kate Ceberano shifted focus to the second single from the upcoming Brave album - but it wouldn't even manage to make it into the top 10. I always thought "Love Dimension" was an odd choice to follow up "Bedroom Eyes", especially when Kate had much more commercial songs up her sleeve. Don't get me wrong, I like "Love Dimension" - it just seems like a fourth or fifth single, or a great album track. Surely now would have been the time to release the rousing "Brave", which instead had to wait to be single number three (and then share the glory with "Young Boys Are My Weakness"). Given how ubiquitous their brand of flamenco-inspired world music would become in 1989, it's amazing that I had completely forgotten about Gipsy Kings until putting together this post. The song that really got the world stamping their feet along in time was "Bamboléo", which had originally been released back in 1987 in France. A couple of years later, the group, who actually sang in Spanish, became big stars in Australia, where their self-titled third album became among the year's highest selling. Like the last big foreign-language hit on the ARIA top 50 (1987's "La Bamba"), "Bamboléo" was one of those songs everyone loved to sing along to - even though most people had no idea what the words were. Hot on the heels of "Nature's Lament" and "If A Tree Falls" comes this third environmentally friendly single to feature on the chart in some capacity in recent weeks. Performed by country legend John Williamson, the anti-logging song was quite clear in its stance and, as such, provoked the ire of those in the business of deforestation. Indeed, the track made a much bigger impact than this peak position would suggest - who didn't know the refrain "rip, rip woodchip, turn it into paper"? - and no doubt helped John score his first chart-topping album when Warragul was released in October. Next week: a remix of a classic Australian synthpop track from the early '80s plus the return of a '70s band with their first studio album in nine years. Before then, 2006 is up in my journey through my favourite songs from years past. I gather by 'No More Rhyme's appearance here that it didn't later make it to the Breakers list, despite peaking at #58. I thought 'Anything Is Possible' had a chance of becoming another hit for her, but clearly that wasn't to be. I don't think I've heard 'No More Rhyme' since 1989, though I briefly had it on a video tape from Video Hits before wiping it the following year. Perhaps it was one too many ballads from her. Her next single made Breaker status, from memory. It's strange to see a new single promoted though after the previous one had only been in the top 50 for 6 weeks. I remember seeing the Michael Damian video a couple of times on Rage before the top 50 began. Like 'Wind Beneath My Wings' before it, I hadn't heard (or even heard of) 'Under the Boardwalk' before it entered the top 50. When it got to the chorus, I knew it was a familiar old song I never knew the name of. I'm shocked to learn that the original only peaked at #62 here. One of those big 'hits' that actually weren't (here anyway). I never knew until 1989 how Sinitta's name was pronounced. I think I missed 'So Macho' when it was released, though it sounded vaguely familiar when I heard it on a short-lived community FM station in Melbourne, Street FM (I think), in 1999. One of the DJ's obviously liked her, as 'Cruising' (which I remember seeing listed as a double A-side with 'So Macho' in Number One on a Sinitta chartography, but hadn't heard until then) was also regularly aired. I caught an interview with her in the local Smash Hits in 1988, but didn't know who she was. I assumed her name would be pronounced 'Si-knit-ta'. I'd heard 'Right Back...' a few times before it charted, on Triple M's Top 8 at 8 (as the 12" version), but didn't connect the dots that it was her until seeing it in the rage top 50. Things you learn from music... I'm pretty sure I hadn't heard of 'dimensions' until 'Love Dimension'. It annoyed me a little though that the title was hardly mentioned in the song. Maybe it would have been a bigger hit if it was titled 'When Will You Give Me' (?) or 'Love and Affection'. My dad bought the Gipsy Kings album on cassette (and possibly the follow-up too), which became a staple on our car's cassette deck. I preferred the slightly dance-y, remixed version (which Countdown Revolution played but Rage did not) to the regular acoustic version. I preferred 'Djobi Djoba' to 'Bamboléo', so of course it flopped. I always found the "throw it in the bin, don't understand" lyric (which I thought I'd misheard listening to it again now... but it appears in the final chorus bit) a bit jarring in 'Rip Rip Woodchip'. As I think I mentioned a few weeks back, I was truly shocked when 'Rip Rip Woodchip' cracked the top 50. I think I thought it was just one of those 'videos made for a TV ad', like the kind Kamahl would do. The ultra-low budget video explains it. The song isn't as bad as I remember now, listening to it again. In fact, it's almost catchy! Strange that the single is listed as being a 12" (or '30cm'). I can't imagine anyone wanting to buy it on that format. I don't think I've ever heard DG's 'No More Rhyme'? Maybe I should play the video here! Never saw it on any of the music channels back then or any promotion for it? My fave single off 'Brave' would be 'That's What I Call Love'. I'm glad it was a hit as the fourth single release in March/April 1990. I thought 'Love Dimension' was a good choice as the second single. Wasn't too keen on the double A side as the 3rd single. I can't stand 'Young Boys...' but was glad 'Brave' received most of the airplay on radio and TV instead of it. I have Michael Damian's 'Rock On' on a US compiled compilation - 100 hits from each year (1980-1996). It was burnt for me on 2 discs, so don't know the title or image of the album. It has so heaps of US hits that weren't hits or Top 50 hits here. This song always reminds me of a group of artists like NKOTB, Timmy T, Dino etc. LoL. 'That's What I Call Love' was great, but she ruined it by only having a boring live performance as the video. It should have had a proper video! If I remember correctly, rage didn't initially air the 'Young Boys...' video alongside 'Brave' when it (they?) was in the top 50, but did after about a month or so, which was the only place I heard the song, other than maybe on Take 40 Australia (where they may have alternated which song they played each week). This discussion reminds me that one of the pop magazines (I think Hit Songwords) published one of the 'Love Dimension' lyrics as: "and I'm/am I being used". I assume because they couldn't decipher which it was.